Mozi taught that everyone is equal in the eyes of heaven. For those in power he believed that it should be based off of meritocracy, or those who are worthy of power receive power. This is different than Confucianism because those who are given power in Confucianism are handed the power. Mozi invokes heaven and calls on the Sage Kings to support his precedents. Born in what is now Tengzhou, Shandong Province, he founded the school of Mohism that argued strongly against Confucianism and Taoism. His philosophy emphasized universal love, social order, the will of heaven, sharing, and honoring the worthy. During the Warring States period, Mohism was actively developed and practiced in many states but fell out of favour when the legalist Qin dynasty came to power in 221 BC. 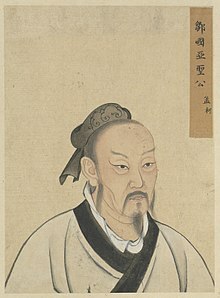 During that period, many Mohist classics are by many believed to have been ruined when the emperor Qin Shi Huang supposedly carried out the burning of books and burying of scholars. 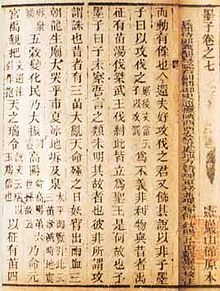 The importance of Mohism further declined when Confucianism became the dominant school of thought during the Han Dynasty, until mostly disappearing by the middle of the Western Han dynasty.